New products made right here in the Cleveland area! Besides all the cool antiques, vintage items and collectibles that you'll find at our store, we recognize that are customers like other things too...like candles, wine jelly, chocolates and caramels! So we have a little of this temptation too! Look out for our samples! 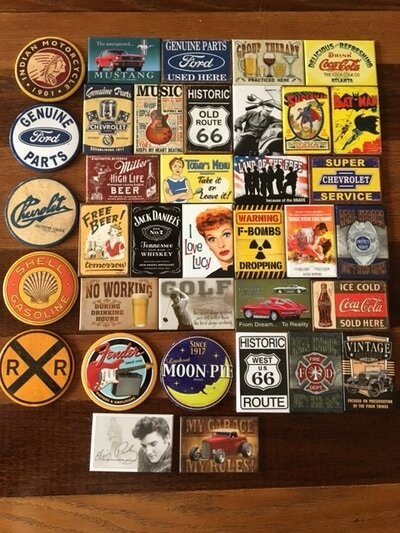 Handmade Soap and tin signs made in Northern Ohio. Saturday & Sunday's we provide fresh baked cookies and coffee...for free! We also have a great supply of handmade greeting cards, party favors, and all sort of customized vinyl applied ceramic tiles and wine glasses for gift giving! All made by one of our owners - Lisa! Make sure you try one of the samples...this is a not to miss item. Great for yourself or a gift! These signs are great! They typically measure 12" x 16" and have punched holes for easy hanging. 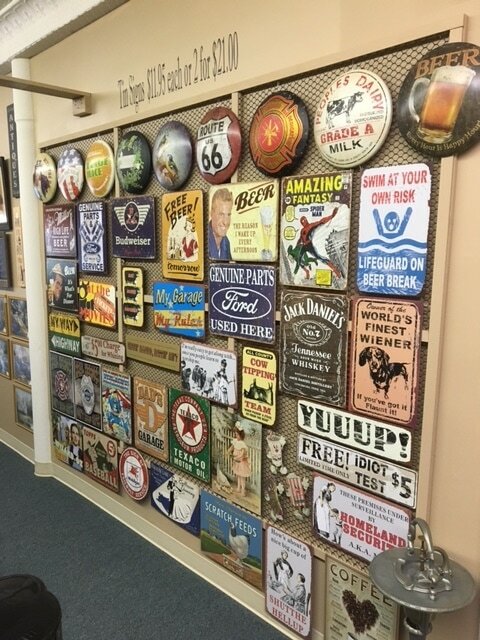 We stock around 75 signs in the shop, have access to an additional 300 signs within 48 hours, and have access to another 800 signs that we take orders for and once we get them, we get them to you! Our magnets are the exact same design as the tin signs, but measure 2" x 3"! Signs are $11.95 each or 2 for $21.00 and Magnets are $4.00 each. This has been making handmade cards for quite some time now. Normally there is a supply of over 60 different cards at the store. Not only does she supply our store with greeting cards, she does custom work to order. So if you need birthday invitations, baby announcements, wedding invitations, etc., Lisa can do it for you! The reviews are in! It's a smash hit! Try one of these and you'll have Chocolate Dreams tonight! Quilted Bug provides you with a multitude of handmade items that are pretty and functional. A little bit of home and a lot of love go into each piece that they make. Custom orders are much appreciated! Yes, this is the great handmade soap product that you see at the local farmer's markets and craft shows in Greater Cleveland. We carry 35 different scents comprised of either Real Soap, Goat Milk Soap or Organic Oil Soap. If we don't carry the scent you want (out of the 77), let us know and we'll order it and start stocking it. All the soaps are reasonably priced at $6.00 per bar. We also carry Foaming Hand Soap. Real Soap: The original old-fashioned real soap, gentle and safe for your skin. Goat Milk Soap: Real Soap with a touch of fresh goat milk to enrich and strengthen skin. Organic Oil Soap: Real Soap made with all certified organic soapmaking plant oils. Vinyl Application onto Ceramic Tile, Glassware and other items! Lisa also creates handmade work with customized vinyl applications on ceramic tiles, all sorts of glassware, old windows, wood boards and walls. It is a professional machine cut vinyl that is hand applied to each item. It is weather proof. Hand washing is necessary for any stemware. Made in North Royalton. Click on "Vinyl by Lisa" for more!